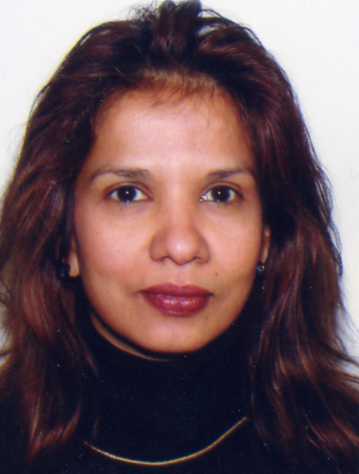 Sandy was born in Colombo, Sri Lanka to Buddhist parents who were involved in a family owned furniture business. She was the youngest in a family of four children and attended an all girls school. She had a privileged lifestyle where she was completely isolated from any of life’s hardships. Sandy is a descendent of the Anagarika Dharmapala who dedicated his life to spreading Buddhism throughout the world. She was a competitive swimmer and an artist and enjoyed every aspect of growing up in a tropical land. Sandy worked in the family furniture factory prior to studying Art & Design at Derby Lonsdale College. The family business influence led her to further her studies in Interior Design at The Inchbald School of Design, London. Following her education in the UK she returned to Sri Lanka for a practical training year on a hotel project where she met her future husband. At the end of her training year she moved to New York to further her studies where she graduated with honours from Parsons School of Design. At the completion of her education she returned to Sri Lanka and got married later that year. Following her marriage she moved to London where she lived and worked for three years in hotel design and moved to Dubai for ten years. Sandy continued her work in Interior Design in Dubai and spent some time in Oman during that time. In April 1994 her first child was born. She thought life was perfect until at two and a half years of age her son Steven was diagnosed Autistic. Her priorities changed where her life became Steven. She abandoned any thoughts of returning to work and decided to teach Steven instead. In March 1999 her daughter Riana was born. Dubai didn’t have any specialist teaching to help Steven and she decided in July 2000 to return to the UK. Having made many sacrifices to find what she hoped would be a good special needs school provision it soon became evident that his special educational needs were not being met. Following such a let down, she chose to withdraw Steven from the school and educate him at home following a strict home based programme which she delivered herself. Sandy suffered health issues which took her energy away from focusing on Steven’s education. Having suffered for three years she finally had her health sorted in August 2004 after which she felt that she had been given a new lease of life. She now feels that she has regained her energy to do what is best for Steven and the family. Steven is now fifteen years old. After continuous struggles trying to obtain the best provision for Steven, Sandy has once again decided to teach Steven herself. She hopes that once Steven makes progress with his learning at home and when she is able to hire extra help to teach him that she will find time to pursue her passion for art and painting.